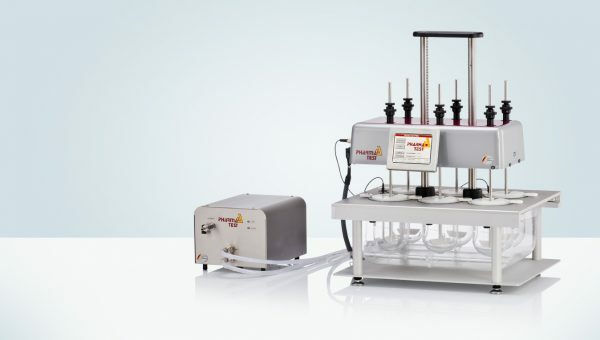 The PTWS 1220 is a 6+6 position, single drive tablet dissolution testing instrument for solid dosage forms as described in USP chapter <711/724> and EP section<2.9.3/4> as well as the DAB/BP and Japanese Pharmacopeia section <15>. The instrument features two additional vessels (approx. 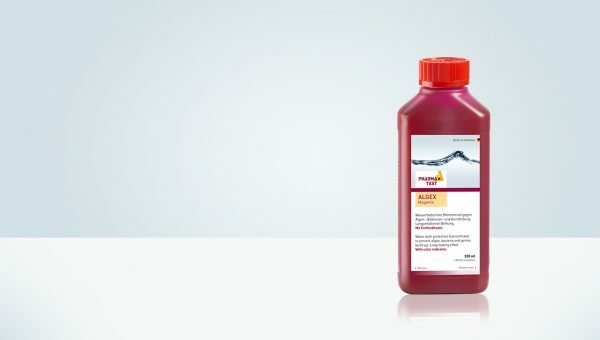 250ml) for media refilling and reference standard media. 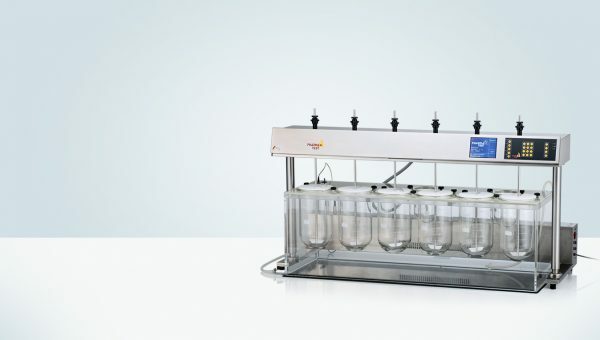 The PTWS 1220 is the ideal choice for Biowaiver studies and dissolution method development. 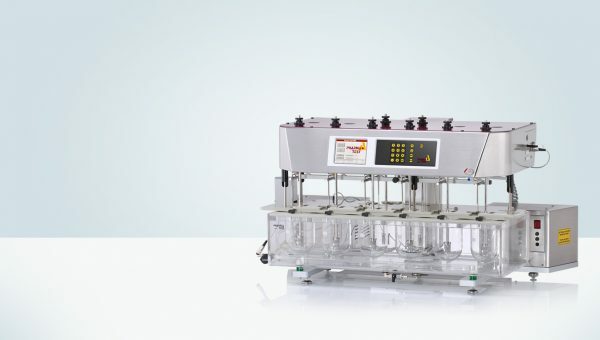 In keeping with our cutting edge design, a large color, touch screen allows control of the various mechanical features of the instrument such as the tool stirring speed, lift drive and heater. The instrument control is menu driven. Status messages and color changes on the display inform the user of the status of critical instrument parameters, e.g. bath target temperature not reached. A status bar provides a quick overview and uses the familiar traffic light system green – yellow – red. Access to the instrument can be password controlled if required. If certain operational parameters form a regular feature of the daily routine, then these can be incorporated into a test method for faster set up. 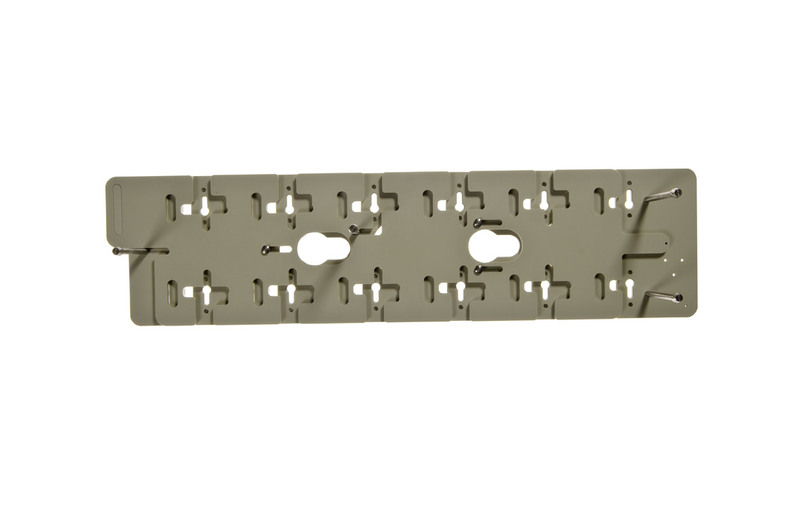 These parameters can be tool speed, target bath temperature, sampling time points and so on. The test method memory capacity is almost limitless. As soon as the test is started, a screen saver can be activated with the most important information displayed in large script so that this information remains visible even at time when the operator is not standing directly in front of the instrument. 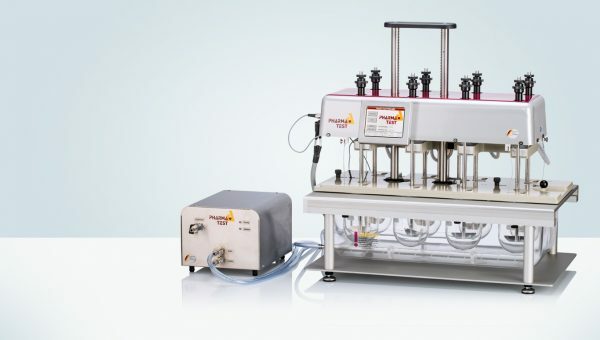 The PTWS 1220 uses the Pharma Test MonoShaft™ design. 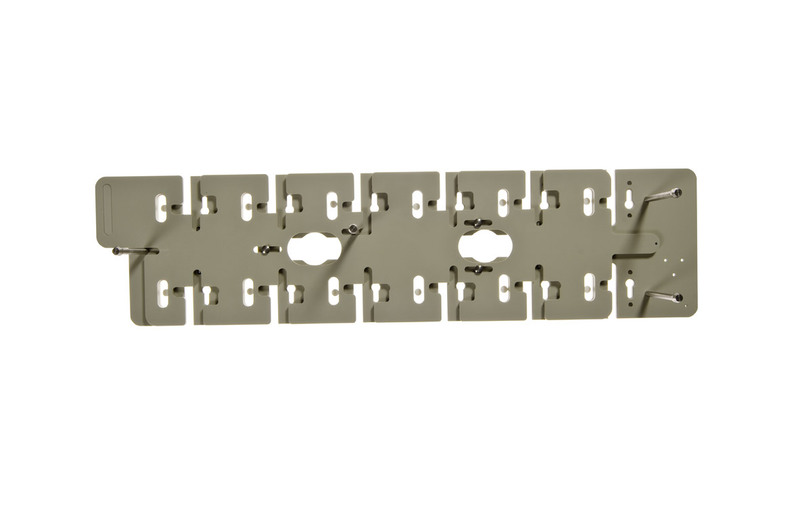 Tools consist of the main shaft plus interchangeable tool heads (adapters). The main shaft remains in place in the instrument regardless of the tool head being used. The clearance of each tool from the vessel base will always be correct once the main tool shaft has been installed and fixed in its position. A wide variety of different stirring tools is available while the standard configuration includes USP/EP App. 2 Paddle stirrers. The PTWS 1220 features a three-point individual centering system for each dissolution vessel (picture shows view from below). The vessels are held in position by three adjustable noses and are inserted into the instrument support framework. Each vessel is correctly centered against the stirring tool, while this position is secured even when the vessels are removed for cleaning and placed back afterwards. The access points for sampling as well as the openings for the tools are contained in an auxiliary, low evaporation, vessel cover. The upper drive is motorized and electronically controlled it offers eight programmable positions: an upper cleaning position and lower working positions are programmable depending on the type of stirring tool used. 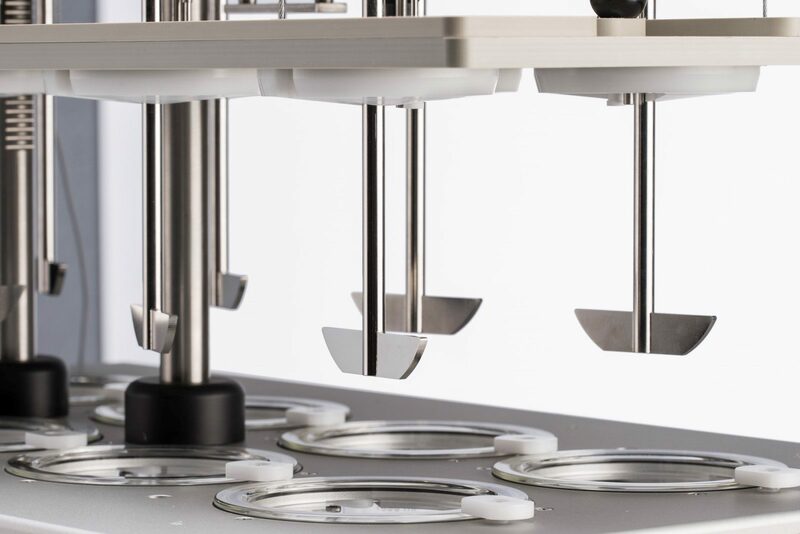 The upper position offers ideal access to the stirring tools and vessels for a change of tools and cleaning steps between the dissolution tests. The rigid design of the electronically driven lift mechanism ensures that the whole lift drive mechanism is positioned in a way so that the tool shafts are always kept parallel and at a 90° angle to the vessel walls when in the working position. 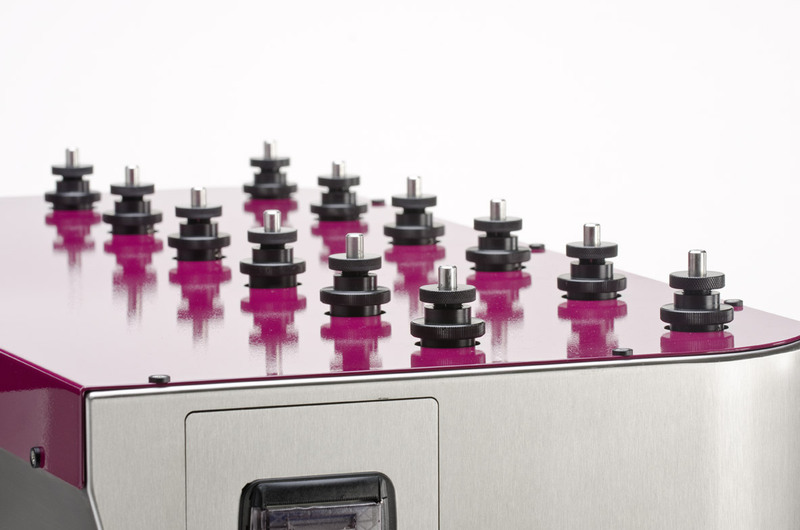 The ultra-fast heating system is installed on an easy to remove platform within the stainless steel housing. The heat up time of the water bath has been reduced by approx. 40% compared to previous models. Access to pump, heater and all safety sensor system is possible without to move the bath from its qualified position. The connections between the heater and the bath are made by „quick connect fittings“ for easy connection and disconnection. Water is pumped through the system using a powerful, yet quiet, circulation pump. The pump itself is spring mounted (to limit vibration transmission) and the flow-through heater is protected from overloading (overheating in case of control electronics failure) via a thermal fuse as well as a thermo switch for added security. 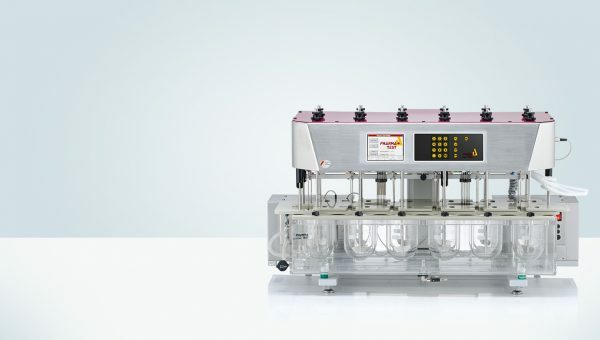 With service and maintenance in mind, access to the compact pump and heater section is easily achieved without having to move the main body of the instrument. 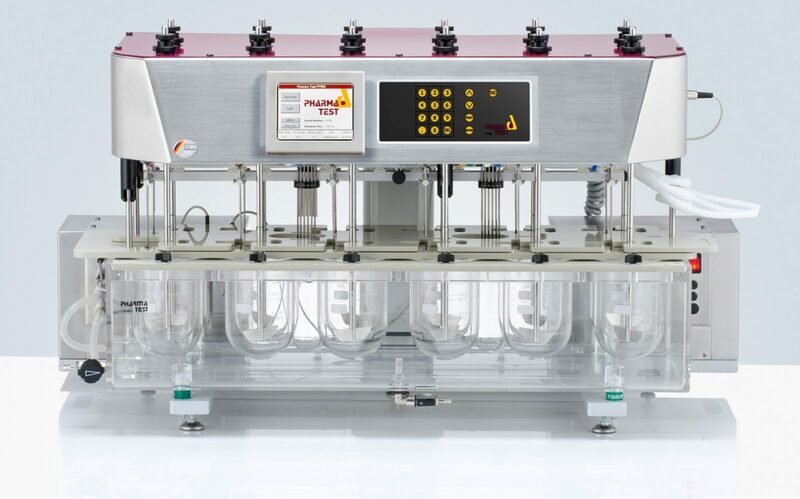 The U-shaped water bath rests on vibration absorbers to avoid any vibration transfer from either inside the instrument or even from external equipment placed on the same bench surface, to satisfy the requirements from USP <711>. The bath cover can also be easily unscrewed for cleaning. The water bath contains a water diffuser for faster heating and to ensure that heated water is evenly distributed throughout the whole bath. A tap allows emptying the bath if this is required.